Molly Smith is a kid on a mission. The nine-year-old from Cave in South Canterbury snaffled the Burger King Cat B High Points Series aboard her new pony, 16-year-old Bexley Lodge Tinkabella – or Tinks as she is known at home. Both Smith and Tinks are well-performed in their own rights – Tinks having won the Cat B HOY title a few years back and Smith taking out the Cat A series with Little Mindy Lou last year. While Little Mindy Lou headed to her new owners, the Robertson family, just before Christmas, Smith teamed up with her at HOY to take out the Cat A of the Year title. Tinks and Smith had a good season leading into HOY, winning the Southland/North Otago Cat B Series. On their first show hunter outing they won the high points class, and have continued to do well since. They’ve had 10 wins and two seconds from the 12 scores to county. Smith is trained by mum Kelly Evans, a former grand prix showjumper, and says the two have done a lot of work with Tinks. She says the pony’s lovely nature and good looks mean the family may well use her for breeding in the future. While their success at HOY was in show hunter, they have also been dabbling in showjumping, and are going well up to 1m. Smith also has a “cool” grand prix showjumper in Sushi. 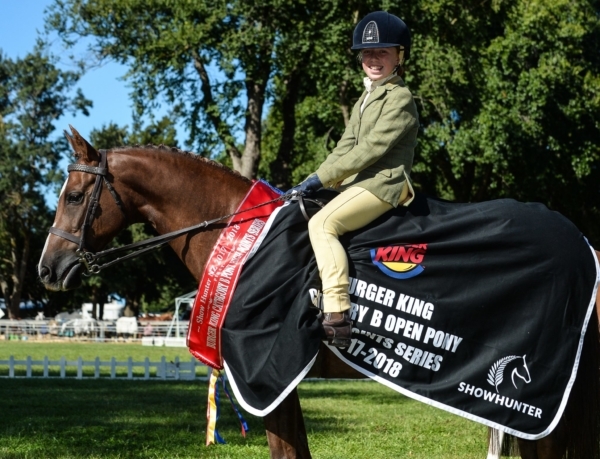 Burger King Cat B High Points Series: Molly Smith (South Canterbury) Bexley Lodge Tinkabella 1, Georgie Wilson (Taupo) Summer Fiesta 2, Amelia Newsom (Tauranga) Moonspirit Jitterbug 3, Quinn Coutts (Mosgiel) Goosebumps 4, Libby Wilson (Taupo) Waimeha Tayza 5, Lily Plunkett (Blenheim) Hikumutus BB 6.